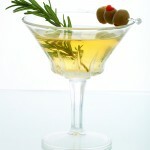 Muddle stripped rosemary and simple syrup. Add ice, gin, cointreau, and cucumber juice, shake well. Strain into cocktail glass. Garnish with half salted rim and sprinkle of cayenne pepper.